Kevin Ingram was second in the 1985 championship in this car. Bruce Mc Coy attests to the car being fast and very good handling. 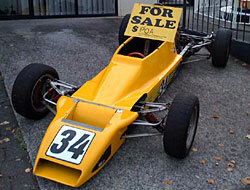 Then sold to Grant Tolley, who raced it mainly at Manfield club events. Grant is 5ft 10″ and of solid frame so the car will accommodate a larger driver. The engine has been rebuilt by Andrew Hollywood at a cost of $4000 and Bruce McCoy believes it would pass HFF engine checks. Car has a Hewland Transaxle. The car is ready to race. For sale at $15000.Covered trailer is also available for $3000. Contact: Grant Tolley at 07 8477193 or 027 6566407.